Dearest Blog: Today it was off to Marquee Cinemas for Independence Day: Resurgence and The Free State of Jones. Spoiler level here will be mild, nothing that hasn't been divulged by the trailers. First up: Independence Day: Resurgence. Two decades after the first Independence Day invasion, aliens prove they can't take a hint. Well, dear reader(s), if you thought this reboot was unnecessary before, just wait 'til you see it! Resurgence features some pretty imposing disaster effects, and, if you're a fan of the first one, there are plenty of familiar faces to indulge your nostalgia, but unfortunately, the movie doesn't have much else going for it. Resurgence gets off to a slow start and, despite the fact there's plenty of action, it never really seems to pick up. Wooden performances exacerbate clunky dialogue, emotional moments are worse than contrived, and the "one world, one people" message is so heavy-handed I kept expecting everyone to sit in a circle and sing Kumbaya. If I'd rolled my eyes any harder, I'd be writing this review out the back of my head. Independence Day: Resurgence runs 120 minutes and is rated PG13 for "sequences of sci-fi action and destruction, and for some language." Independence Day: Resurgence is a silly, unnecessary exercise in bad science fiction. 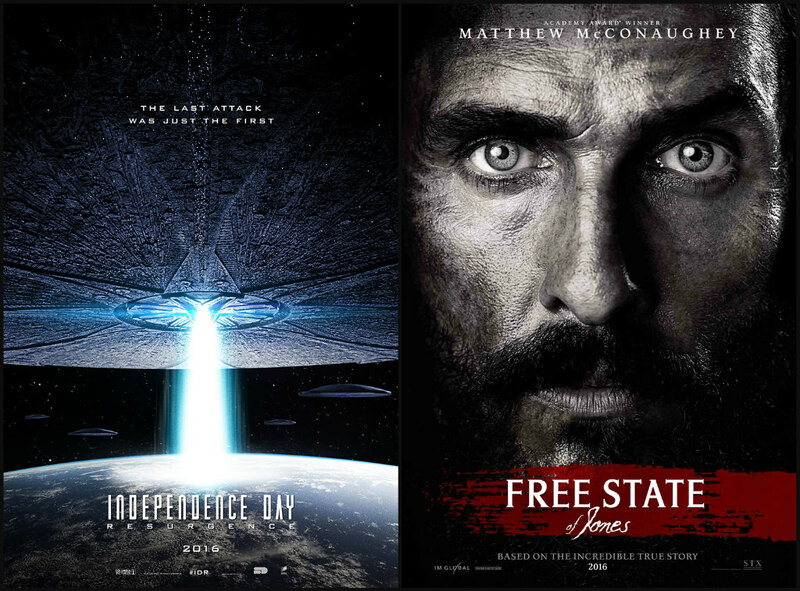 Of a possible nine Weasleys, Independence Day: Resurgence gets four. Next on the agenda: Free State of Jones. Tired of poor people dying to keep rich people rich, a Confederate deserter declares his indpendence. Movie lovers: would you believe me if I told you Free State of Jones is the *less* preachy of the weekend's two new epics? I know, right?? While it does run overlong and is in no hurry to get anywhere, Free State of Jones never seems to drag. Matthew McConaughey, Gugu Mbatha-Raw, and Mahershala Ali headline a stellar cast that makes a pretty average drama seem much better. The film is gruesome and hard to watch at times, but it boasts extraordinary production design and a lovely score by Nicholas Britell. It also serves as an important and timely reminder that being horrible to others is a lousy idea that invariably lands a person on the wrong side of history. Free State of Jones clocks in at 139 minutes and is rated R for "brutal battle scenes and disturbing graphic images." It'll be long forgotten come awards time, but Free State of Jones is a pretty solid historical drama that's worth your movie dollar. Of a possible nine Weasleys, Free State of Jones gets six and a half.